Keratoconus (conical cornea) is a condition in which the normally round shape of the cornea becomes develops a cone-shaped bulge, resulting in poor vision. Progression of the condition depends on the patient's age at the time of the onset. The earlier the onset, the faster keratoconus progresses. The condition is always bilateral and asymmetric - meaning that it affects both eyes, however one eye may be more affected than the other. Until recently, corneal transplant surgery was the only option available when a keratoconic eye becomes intolerant to contact lens wear. With recent advances in technology, procedures like Intacs® and Corneal Collagen Cross-Linking may prevent the need for corneal transplantation in eyes with keratoconus. 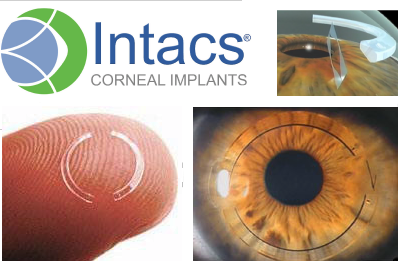 Intacs® are prescription inserts that are surgically placed inside the cornea at a depth of about 75%. These inserts help to flatten the cone shape and improve the fit and comfort of contact lenses. The procedure is done using a special femtosecond laser to precisely create the channels. The Intacs® procedure is done by administering anaesthetic (numbing) drops to numb the eye, and takes about 15 to 20 minutes per eye.